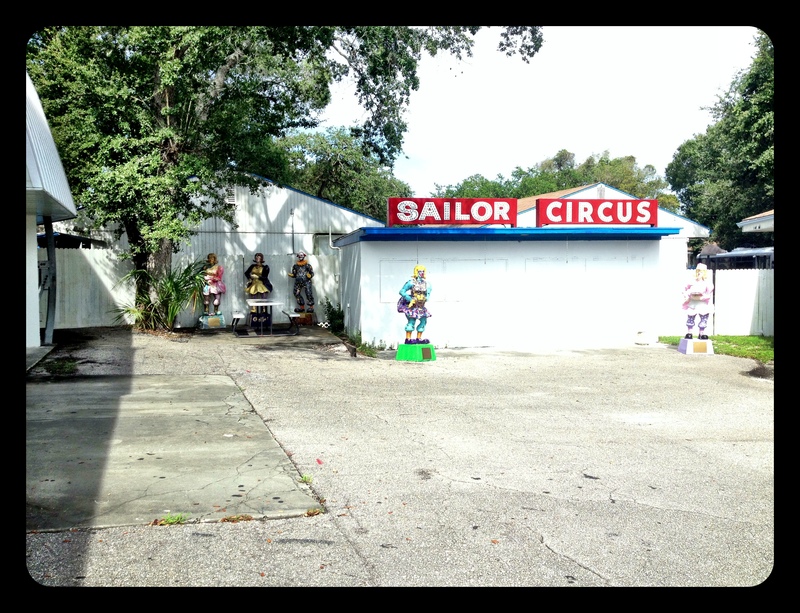 I stopped with a friend to take pictures of the Sailor Circus tent and, as we walked around to the back, we did not expect to see clown statues. 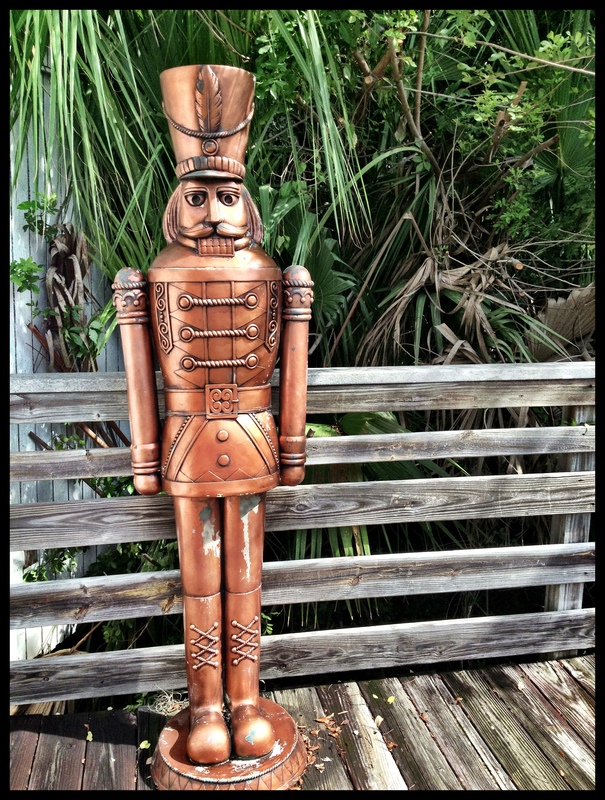 It was fun to take pictures of them, but one statue of a copper soldier did not seem to fit with the setting. I originally posted this as the 52 Week Photo Challenge theme of “Out of Place”, but I realized I had already used that theme – so I see on our list that we also have “My Hometown.” Why not??? 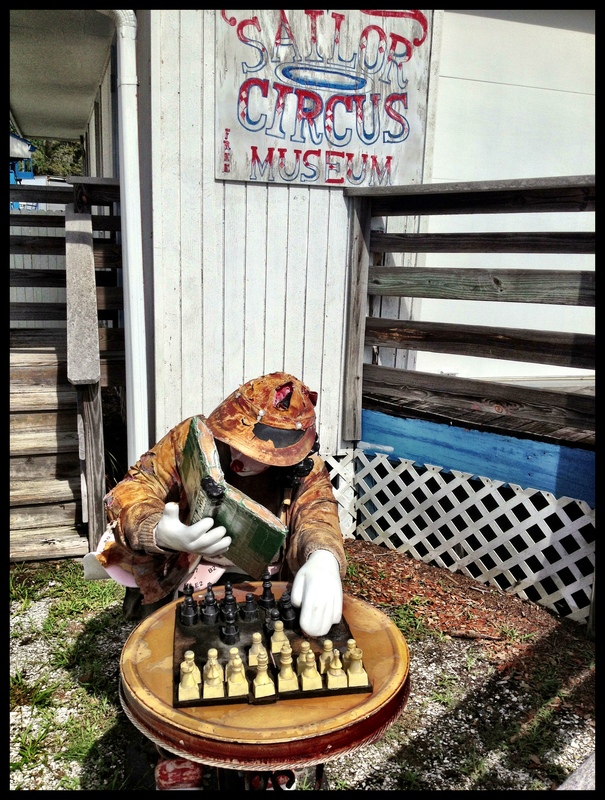 Sarasota is known as Circus City. 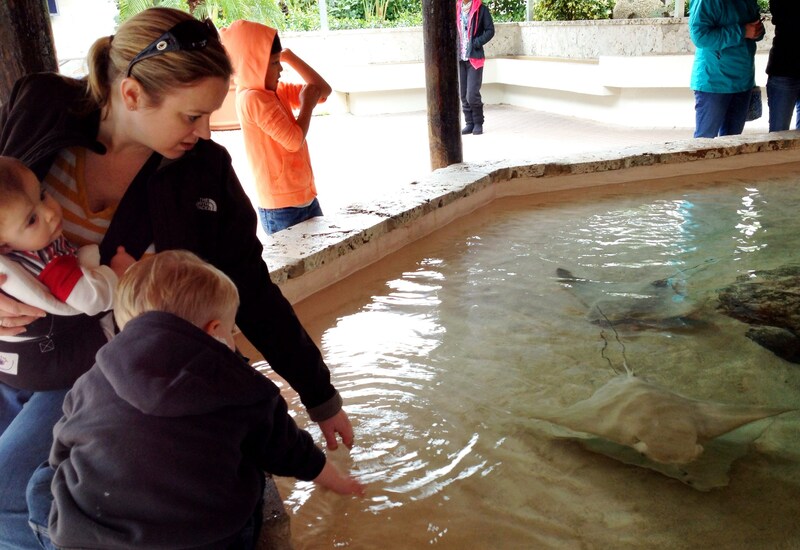 Sarasota is so many things to so many people, which is what I truly love about it. And I am proud that it has the unique history of a Circus heritage. In 1927 John Ringling announced that Sarasota would become the winter headquarters of Ringling Bros. and Barnum & Bailey Circus. This boosted tourism for Sarasota as the public paid to watch behind the scenes of “The Greatest Show on Earth” as the circus performers and staff prepared for their new shows. 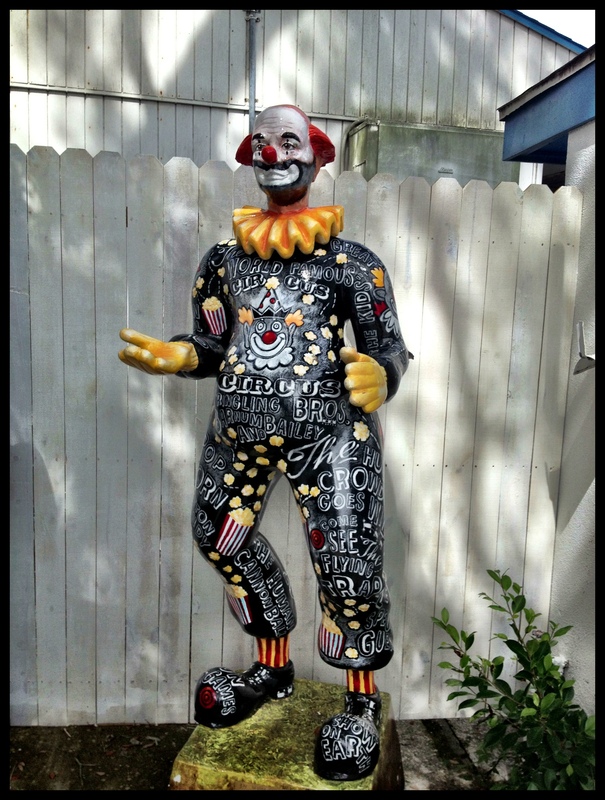 In 2007, 50 clown statues were scattered throughout the downtown Sarasota area to celebrate our rich circus heritage. 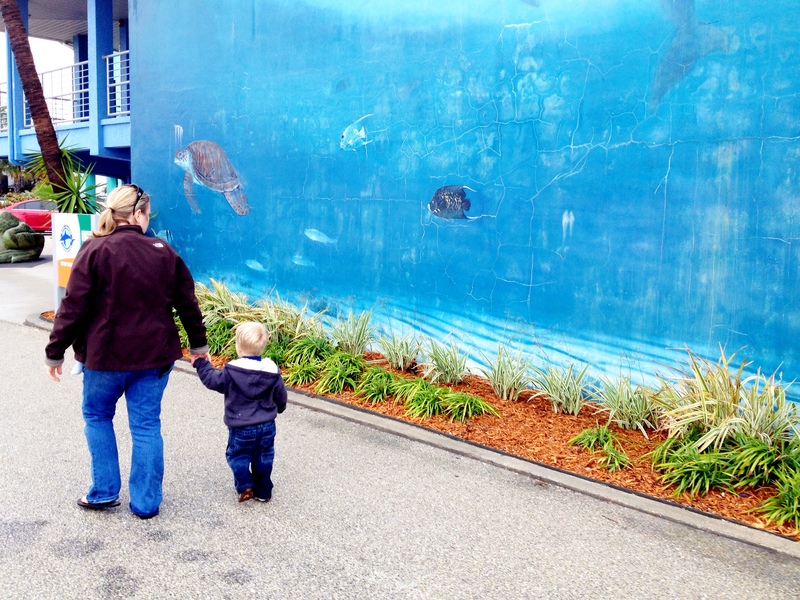 This outdoor art event was created to benefit the Children’s Services Program at Tidewell Hospice and Pallative Care. The program was a fund raising event for children suffering from potentially fatal illnesses. 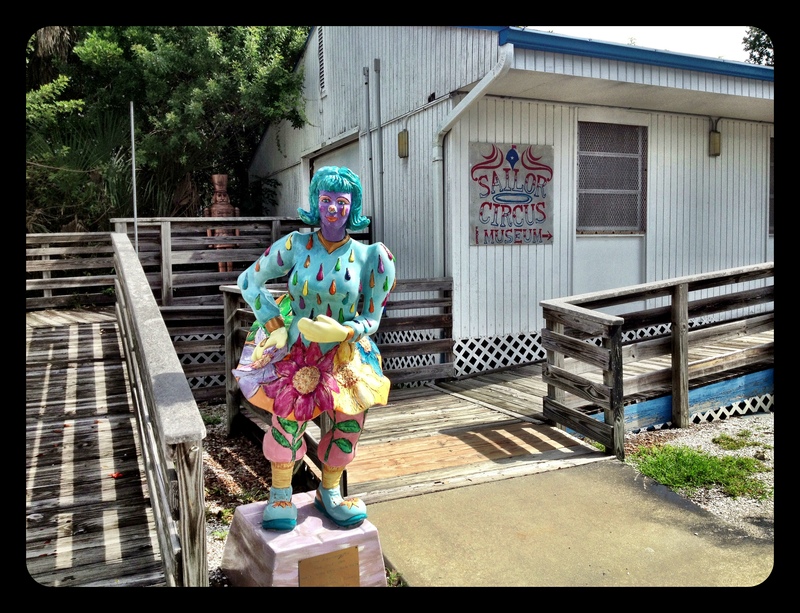 The statues were funded by various local businesses and individuals, and then were auctioned off. 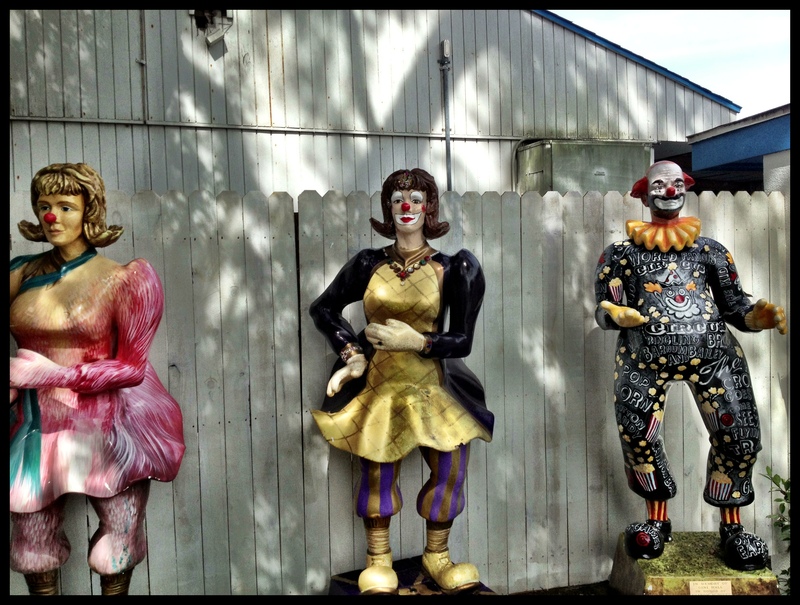 It appears some of the clown statues found a home at the site of the Sailor Circus. 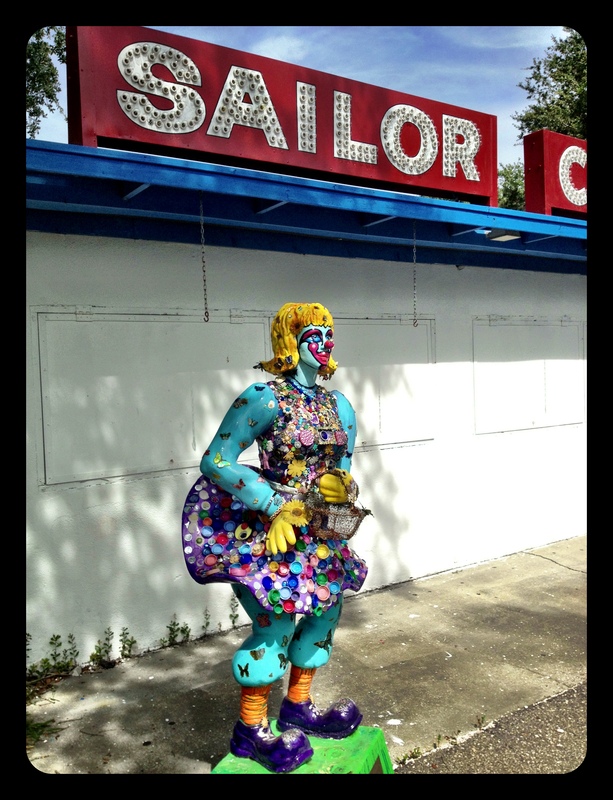 Sailor Circus is one of the many unique features of Sarasota. 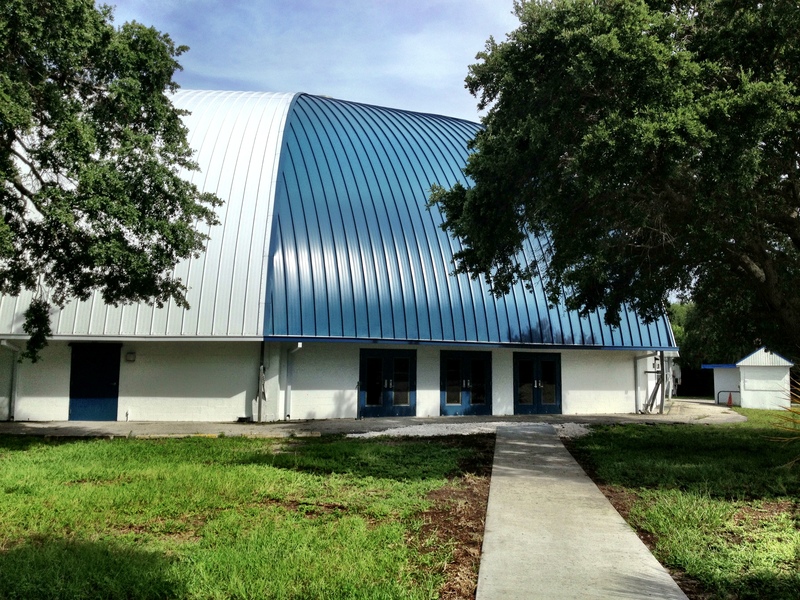 The circus arts program originated as part of the gymnastics program of Sarasota High School in 1949. In 1952 the Sailor Circus was granted permission from Ringling Bros. and Barnum & Bailey Circus to call itself “the greatest little show on earth.” It is interesting that this is the only time that copyright permission as been granted to any performing arts troupe outside of the Ringling organization. The Sailor Circus has grown into a youth circus arts program open to all Sarasota County students from 4th grade to 12th and is America’s oldest youth circus. Over the years, thousands of students have trained for countless hours (as I can attest as a mother of one such student) to perform the same tricks you would see in a professional circus with dedicated coaches and volunteers. They are taught acts as clowns, jugglers, to perform on unicycles, the flying trapeze, and the high wire. The Sailor Circus Academy is promoted as an after-school training program for students aged 8-18 to develop life management skills, gain self-discipline and bolster confidence and a commitment to achievement, all in a circus atmosphere. 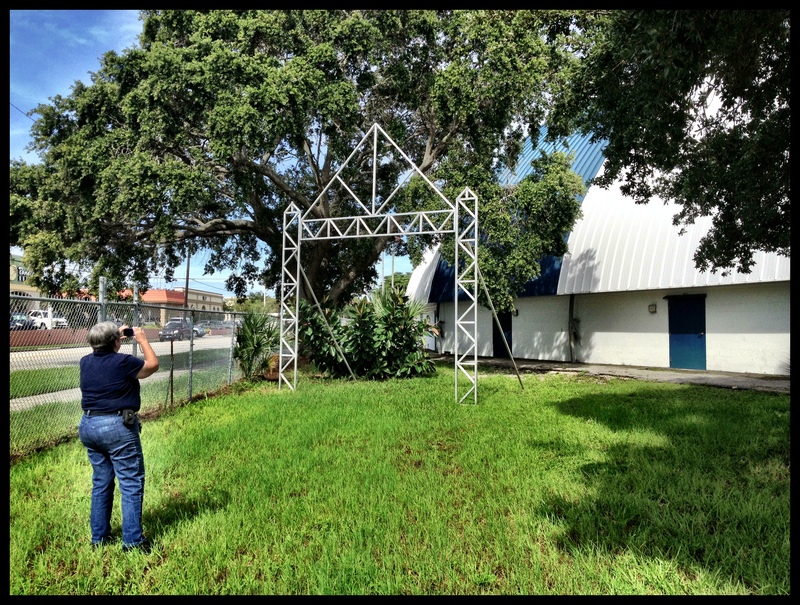 The students are major contributors to the circus legacy in Sarasota. As millions have enjoyed programs at the Sarasota Sailor Circus, The Greatest “Little” Show on Earth is now known worldwide. Categories: 52 week photo challenge, Circus, History, Sarasota | Tags: Barnum & Bailey circus, camera quote, circus winter headquarters, clown statues, clowns, Dorothea Lange quote, Greatest Little Show on Earth, John Ringling, performance, Ringling circus, Sarasota Sailor Circus, Sarasota students, tin soldier | Permalink. Many times when you own a motorcycle, you want to customize it and make it your own. I tend to like hearts and love the idea of getting out and enjoying the paradise of Florida – so here I’ve had the two ideas combined. This image started as a light sketch of a heart and evolved from there. Can you see it?? Life’s a journey. Enjoy the ride. Categories: 52 week photo challenge, Motorcycle, Travel | Tags: custom bike mural, Four wheels move the body. 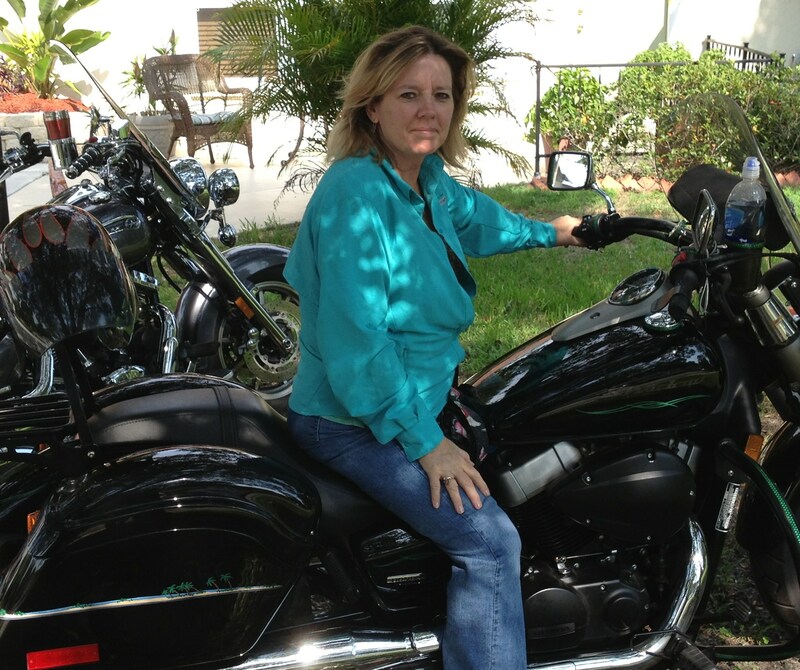 Two wheels move the soul., Hearts, Honda 750 Shadow, Life's a journey. 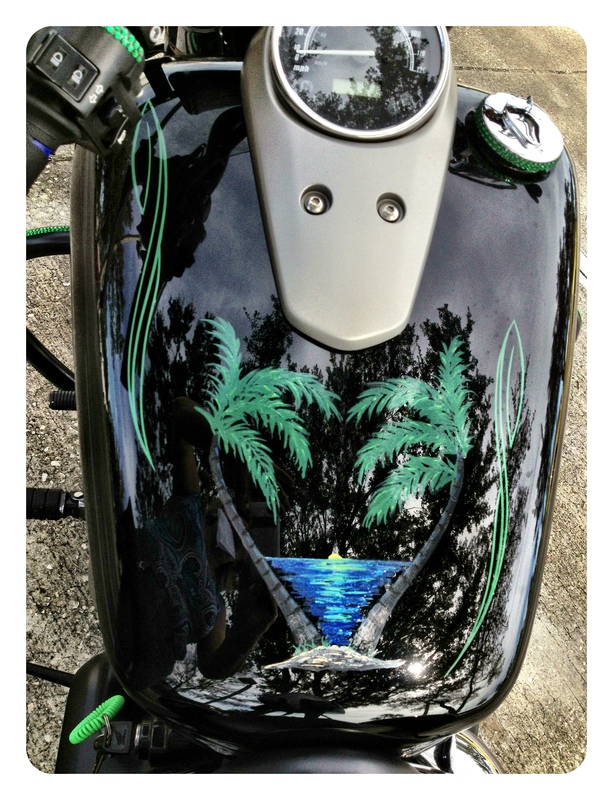 Enjoy the ride., motorcycle mural, motorycle gas tank paint job, palm trees | Permalink. There is a lot you can learn from kids. 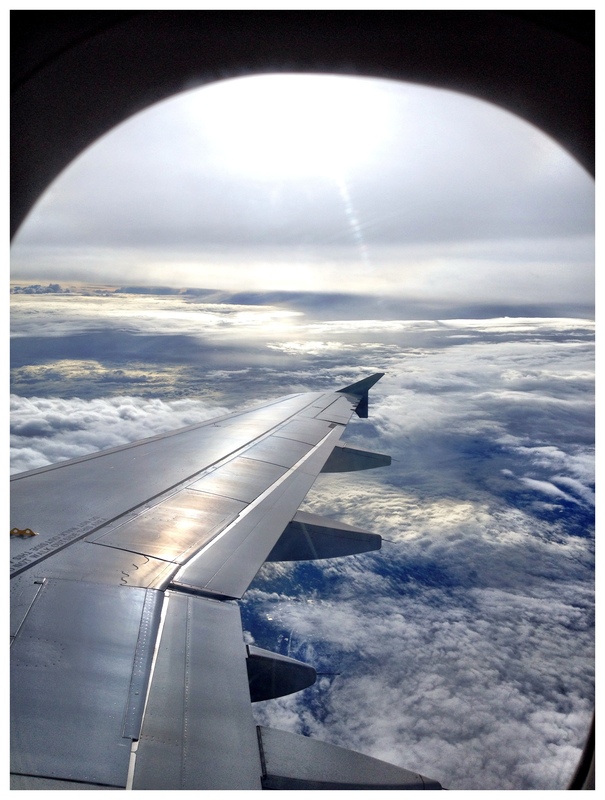 My two and a half year old grandson Ethan is enthralled by airplanes – but when he spots one up in the clouds, he correctly tells me “it’s a jet, Gramma.” So here’s my window seat view from my last trip, but I don’t know if I should say it’s an airplane window or a jet! Categories: 52 week photo challenge, Grandchildren, Travel | Tags: airplane, clouds, jet, Jet Airliner, Steve Miller Band, window seat | Permalink. Sure, it’s super being a gramma, but I must say one of my biggest joys is watching my daughter interact with her young boys. I am so very proud to see the influence she has on molding and shaping their young minds. 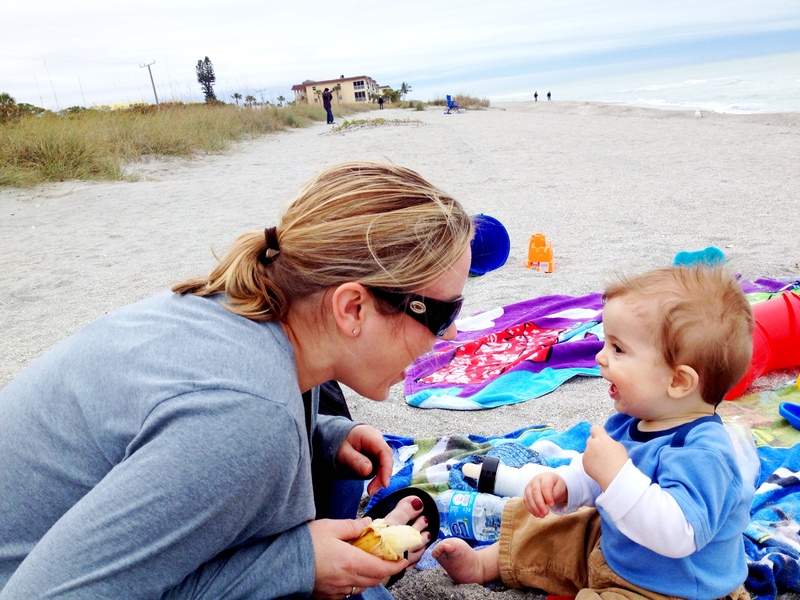 She loves on them, encourages them, reads to them, laughs with them, plays with them, teaches them, corrects them …. Phew! My job is done! 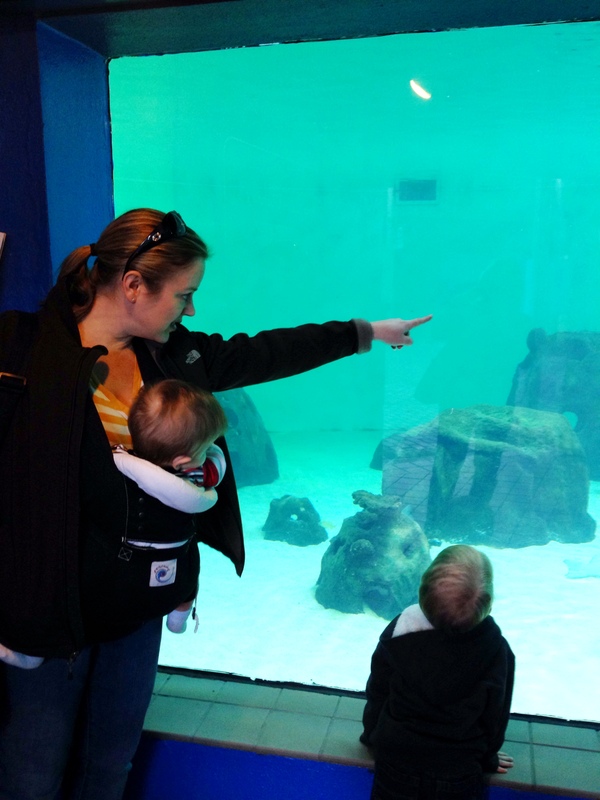 There’s nothing better than raising your children and having them appreciate what you went through as they raise their own – and seeing what a great job they are doing as parents themselves. 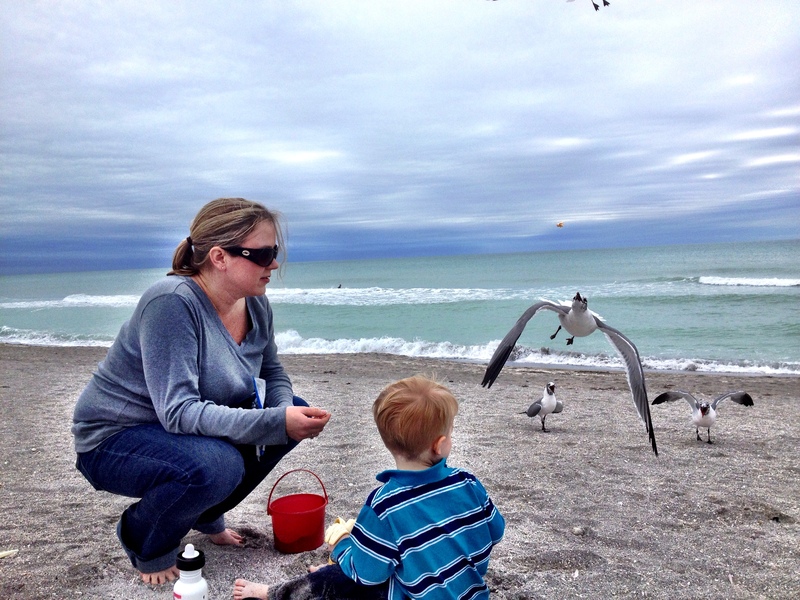 Categories: 52 week photo challenge, Beach, Family, Grandchildren, Sarasota | Tags: being a mother, children, grandsons, Mote Marine, Proverbs, Proverbs 22:6, Train up a child, Turtle Beach | Permalink.